Ο Johnny Gioeli ξεκίνησε την καριέρα του με τους Hardline (τους δημιούργησε το 1991 μαζί με τον αδερφό του, Joey), αλλά έγινε γνωστός (κυρίως) ως ο τραγουδιστής του Axel Rudi Pell από το 1998 (μέχρι και τις ημέρες μας). Μετά από δυόμιση (και βάλε) δεκαετίες καριέρας αποφάσισε να κυκλοφορήσει τον πρώτο προσωπικό του δίσκο. 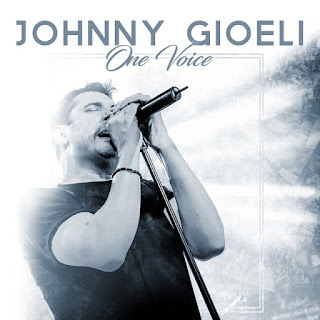 Δελτίο τύπου: «If you are unfamiliar with the name Johnny Gioeli and the bands he is involved with, Hardline, Crush 40, and Axel Rudi Pell, then you have simply missed out on one of the most gifted voices to grace the hard rock genre in the past 25 years! Gioeli will release his very first solo effort, entitled “One Voice”, via Frontiers Music Srl on December 7th. The title “One Voice” is a tribute to the fans who have supported Gioeli’s career for decades. Musically, of the album, Johnny says, “I love guitar driven rock. I love songs that have a direct impact, gets you thinking and puts you in a positive frame of mind". When asked why he decided to do a solo album at this point in his career, Gioeli says, “[c]reating music is my life. Starting with a pin needle of an idea and cultivating that idea into a song that has an effect on someone has always fulfilled me musically. When a young man in my hometown had a life changing accident leaving him paralyzed, I knew I wanted to do something special. I wanted to make this solo album to help him with some of the enormous costs associated with rehabilitation. I also knew that those who love the music I make are fans for life and I knew they would help too. It’s a testament to the beautiful hearts that circle this globe. I woke one morning with the title ‘One Voice’ in my head knowing that I need air from others to sing. I am so proud of this uplifting album. It’s been said that it is the ‘feel good album of the 21st century’. I’m grateful for those words”. “‘One Voice’ is the sum of my efforts to bring a world together for the love of music”, muses Gioeli. “If you can imagine fans from all parts of the world…. the Middle East, Europe, Asia, Scandinavia, Australia etc….all of them coming together to donate money to a kid they don’t even know…it’s a testament to the song ‘One Voice’. We are ‘One Voice’ together, we are love and hope forever, we are one world that matters, so let’s all just help each other”. Of the team that helped him craft this album in the studio, Johnny says, “I have an extremely talented group of musicians performing with me on ‘One Voice’. Eric Gadrix on guitar, who wrote the musical compositions, Marco di Salvia on drums, Nik Mazzucconi on bass, and my Hardline bandmate Alessandro del Vecchio on keys, who is also my trusted producer, engineer and lil’ brother.